February 19, 2010 - Transport Workers Union leaders, who represent more than 28,000 workers at American Airlines and American Eagle, announced this morning that unless all outstanding contract issues are settled at the two carriers by the end of mediated discussion on March 8, union members will seek an immediate release from federal mediation. Under the terms of the U.S. Railway Labor Act – which governs labor relations in the commercial airline and railroad industries – a release from mediation entitles workers to exercise “self help” essentially the right to go on strike. TWU would be the first union representing a major carrier to request such action from the National Mediation Board (NMB) since the Obama administration took office last year. American Airlines and American Eagle fall under two TWU groups and do not negotiate collectively. American’s TWU representation encompasses seven different work groups who bargain as four distinct and entirely independent entities. American Airlines dispatchers entered mediation in October of 2008, and the remaining TWU groups started mediated sessions spring of 2009. “Four years is time enough to settle a contract,” said TWU International President James C. Little. “In the dark days of 2003, when AMR was in desperate financial straits, it took us just two weeks to reach an agreement which included major sacrifices from our members in order to keep this company alive. 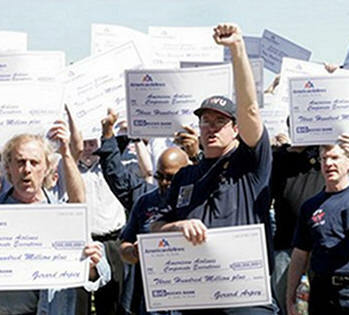 If we could get the job done in two weeks in 2003, an agreement, years in the making, can certainly be reached by March 8.” In 2003, even after accepting painful concessions, TWU members increased productivity and implemented process improvements, such as decreasing the standard turn time required to perform aircraft overhaul. An MIT study shows, on average, it takes about 19 months in the airline industry for the two sides to reach an agreement under federal mediation. In the last two years, 10 unions have actually asked the National Mediation Board (NMB) for release (the NMB is currently working 82 mediations) and only one request has been granted. TWU members work in eleven American Airlines and American Eagle bargaining units in locations across the United States. The parties have reached two tentative agreements – covering aircraft maintenance technicians and fleet service workers at American Eagle that are currently pending ratification. “If AMR is sincere about reaching an agreement, we can settle the remaining nine contracts,” said TWU International President Little. “The company needs to recognize the wage and benefit needs of our members, as well as the contribution they’ve made through enhanced productivity and by bringing new business into the company.” “If AMR executives are not serious, they’re going to find out very quickly that TWU members are – and we’re going to do what it takes to reach a fair and equitable agreement,” Little added. TWU represents ground workers who work in a wide variety of job classifications at American Airlines and American Eagle. American believes any talk of “impasse” or “release” at this time is premature. A self-help determination is also not up to the union, even if it asks the mediator for such a ruling. Only the mediator, working with the NMB, decides when the parties will be released from mediation. American has reported they remain committed to the mediation process and focused on making further progress with TWU at the negotiating table. American Airlines and the Transport Workers Union have been in mediated talks with most groups for just about a year and have reached tentative agreements on 71 percent of all items. "We believe there is still ample opportunity to reach a contract agreement that recognizes the interests of our TWU-represented employees while positioning the company for long-term success".